Should I switch to iPhone from Android? 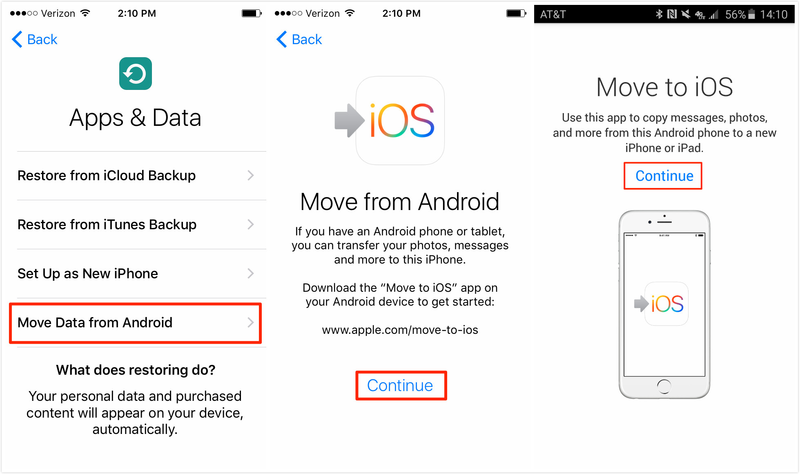 Read this guide to learn several ways to help you transfer data from Android to iPhone quickly. This powerful tool can help you transfer data from Android to iPhone easily and quickly. Just give it a try by yourself. The next generation iPhone is on the way. This year is the 10th anniversary of Apple smart phones, so it’s going to be a big update. As an Android phone user, this time you may be planning to get an iPhone to have a try. To help you switch from Android to iPhone smoothly, we prepare this guide for you. We collect some easy-to-operate ways about switching from Android to iPhone, including transfer contacts, messages, photos, music and etc. Move to iOS is an Android-based app that Apple developed to help users transfer data from Android to iPhone. It’s a decent choice, but not the best one. Many users complain the problems they meet during the transferring. Besides, you cannot transfer all the Android data to iPhone, and you have to erase iPhone to new to start the transferring. If you prefer an easier way, please move to Part 2 to get it. Your Android phone is running Android 4.0 or later. Your iPhone is running iOS 9 or later. Make sure they have connected to Wi-Fi network. Make sure the phones have enough power. Download Move to iOS app from Google Play. Step 1. Set up your iPhone until you reach the Apps & Data screen > Select Move Data from Android. Step 2. Open Move to iOS app on Android phone > Tap Continue on both Android phone and iPhone > Tap Agree and Next on Android phone. Step 3. Enter the 10-digit code on your Android phone that displayed on the iPhone > Select the data you want to transfer and tap next to start transferring. If you prefer an easy, quick and also free way to transfer data from Android to iPhone, then AnyTrans for iOS, one powerful Android to iOS transfer tool can be your best choice. It lets you transfer contacts, messages, photos, music, ringtones and more from Android to iPhone, just everything you need for everyday use. It lets you preview and then select the data you need, you can transfer all the data at once, some of them or just one item. You do not have to erase your iPhone for every transferring. The transferring is more stable, and it will not be interrupted by the incoming calls or messages. It can help you transfer all the photos, while Move to iOS may fail to transfer some of them. AnyTrans for iOS will convert the format of music and videos to iOS-supported format automatically. It also lets you transfer Android phone data to iTunes or iCloud. If you want to give it try, please click here to download AnyTrans for iOS on your Mac or PC computer. It can help you switch from Android to iPhone smoothly even if you have no prior knowledge of data transfer. 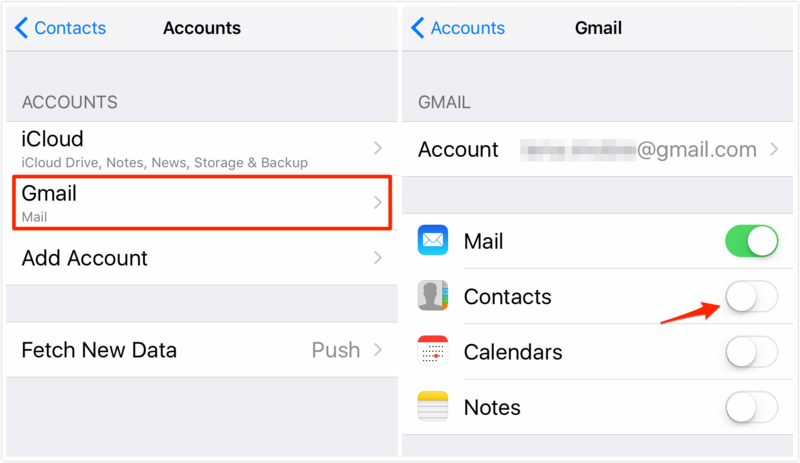 Apple iPhone also supports Google, Yahoo, Exchange and many other email providers, so you can log in your email account on iPhone and sync the mail, contacts, or calendar. Step 1. On Android phone: Settings > Find your Gmail account and tap Sync Now. Then calendars and contacts will be synced to your Gmail account. Step 2. On iPhone: Settings > Tap Mail, Contacts. Calendar or Notes, here take Contacts for example. Step 3. Tap Accounts > Add Accounts > Select Gmail and enter your info > Tap Next. Step 4. Return to the Accounts screen > Tap Gmail > Turn on Contacts or other items. Then, the syncing process begins. If your contacts or calendar are stored in Facebook or Twitter, you can also use these apps to sync them to iPhone. Install the app > Go to Settings > Tap Facebook/Twitter > Sign in with your account > Turn on Contacts. That’s all for how to transfer data from Android to iPhone. If you meet any problem, just leave a comment to tell us and we will help you out as soon as possible. And if you find this guide is helpful, do not forget to share it with your friends.